SOAR’s mission is to provide people with disabilities the opportunity to participate in outdoor accessible activities and help provide them with accessible equipment. There are many benefits to accessing the outdoors: 1) mental, physical & emotional health and wellness, 2) spending quality time with family & friend, and 3) most importantly to view and enjoy all of God’s creation. We believe that recovery consists of healing the mind, not just the body and that recovery is a journey, not a destination. Being in touch with God’s creation draws us closer to the healing journey of love, grace, peace and joy of fellowship with our Lord and Savior Jesus Christ. Therefore the goal of SOAR is to provide not only outdoor accessible equipment and activities but also the resources for people to improve the quality of their life through fellowship. SOAR provides outdoor accessible recreational opportunities for physically challenged people and families and individuals in need with a key focus of improving the lives of those with spinal cord injuries. We will motivate, inspire and create opportunities for people with disabilities who are emotionally, physically and therapeutically in need. SOAR believes that recovery consists of healing the mind, not just the body and that recovery is a journey, not a destination. SOAR is a nonprofit 501(c)(3) organization that believes that much can be done in providing improved accessibility and promoting availability of these resources to persons with disabilities. 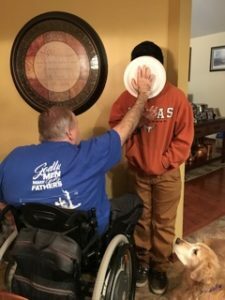 We realize that educating people with disabilities as well as the able bodied citizens of this state is necessary to enhance the opportunities for outdoor recreation for everyone. SOAR will promote accessible recreation to persons with disabilities as well as the general public through special events, newsletters and community education. SOAR will assist in compliance with the Americans with Disabilities Act and work closely with many state, local and private organizations to develop, enhance and/or support recreational opportunities for the disabled across Illinois and other states. We are dedicated to improving the quality of life for people with disabilities. SOAR along with founder Brian Swift were selected to receive the Saint Xavier University 2017 Sister Dorothy Marie Peschon Award. This award is presented to an alumnus who serves s an exemplary volunteer and supporter of the University’s endeavors. Recipients of the award embody the values of the Sisters of Mercy in pursuit of opening new doors to students. This book is focused on teaching you how to overcome the obstacles that are holding you back from being the best version of you and from living the richest life you can live. Within these covers, it is my goal to help you learn new ways to succeed in spite of the UPS and DOWNS that life can sometimes throw in our path. 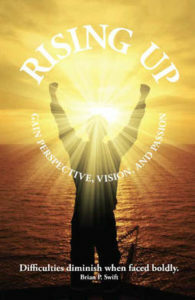 I want you to know that you can RISE UP after your setbacks and be better than ever as a result. This book is written with the express purpose of helping you create your best life! Join me as we get there together.